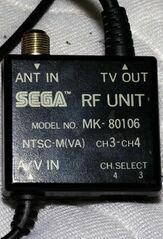 The RF Unit (RF ユニット) for the Sega Saturn is the official method of connecting a Saturn to a television via RF standards. Connector types differ between countries so the units are slightly different per region, but they function in much the same way. In Europe, RF Units were distributed with later consoles. Other regions received superior Stereo AV Cables instead, with RF Units offered separately for consumers with older televisions.